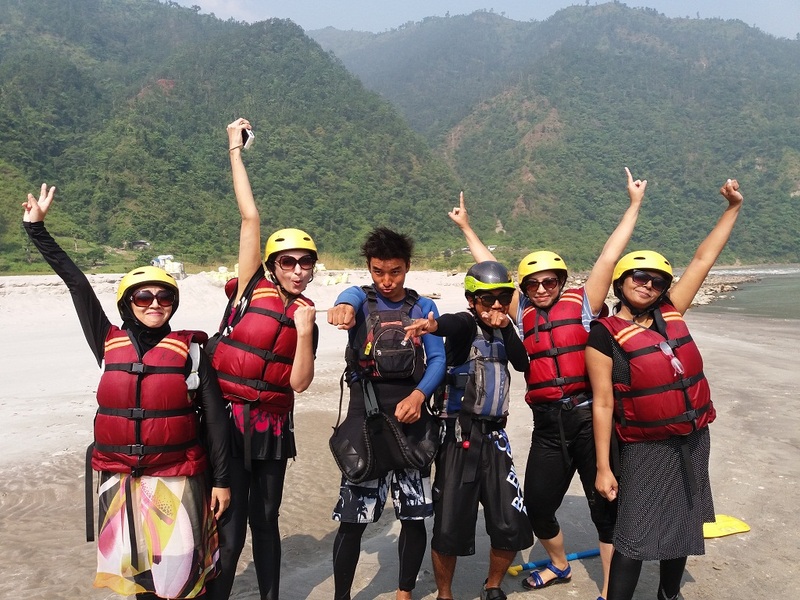 (Before that) The day before our last day in Nepal, we chose to have road trip to Kathmandu and also we booked another outdoor adventure sport: white river rafting in our way. Our friend Ivan was so excited about rafting so that we had to do it. Reaching at Trishuli river for our adventure, we met boat captain Mr. Buddhi and rescue support Mr. Modi. Mr. Buddhi instructed us about all the tricky command to follow during rafting. But to follow those commands were so difficult to follow as the waves of river hit us like crazy. Sometimes boat got hit by the wall of hills and sometimes by big stones beneath. We had a Dutch couple with us on our boat and the dutch guy sat in the first row with me. Rules are to follow the front guy rowing, maintain the same rhythm and listen to Captain’s command. When I asked if there was any test ride, our captain said, we would learn as we go. During rafting, all we could hear our captain’s command, our friend Shawli’s scream and Moona’s cheering voice for Shawli. Maintaining rhythmic rowing was the key. It was two hours hell ride what seemed like an eternity. This was one of the most adventurous sports I had done in my whole life. 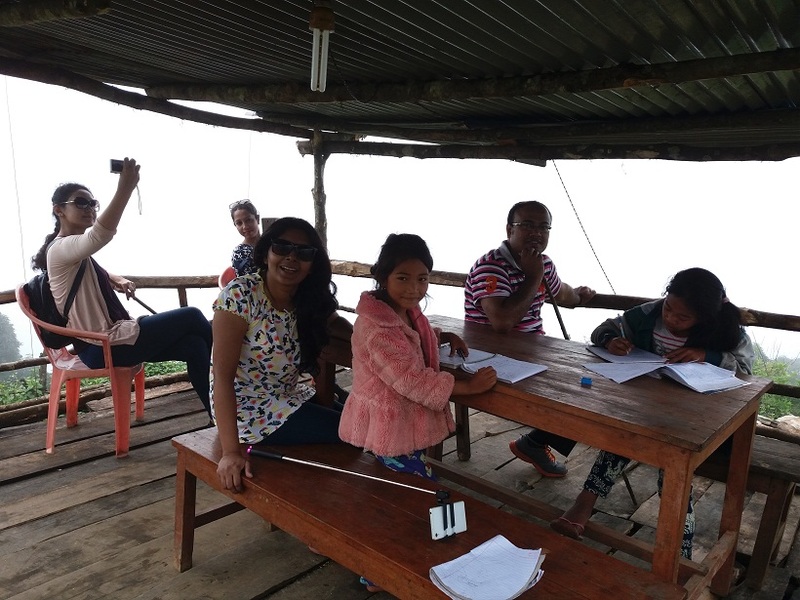 Top of hills at Dhumpus village, we met two Nepali kid doing their homework. When we got back to our Hotel at Thamel, we were so exhausted. But as it was our last night in Nepal, we went out in the streets of Thamel. Thamel never sleeps on Friday night. We had done our last day shopping and finished dinner at a vegetarian restaurant. In the next morning, we tried local street food egg rolls, roti, pakhora and fresh fruit juice. It was all delicious. Finally, the time had come and we headed to Kathmandu Airport at noon. As we approached to airport, mixed emotions of excitement and exhaustion filled our mind. The people are what make each journey so memorable. I was lucky to have my best friends in this trip. Thanks to my travel mate Moona, Shawli, Ruba, Sheoly and Ivan for amazing travel experience and unlimited fun. I definitely put Nepal on my list of places to return to. When to Travel: Best time to visit is on October. There Autumn starts on September and ends on November. What to pack: Pack light and take only the most necessary things. Most things are available there at a good price. Sunglasses and sunscreen creams are must. You can take light jacket with you if you are planning to go some hilly place to stay. Where to shop: My personal choice is from Thamel street shops. Everything you will find there well-priced. Try to shop from there before the day you leave Nepal. This way you can avoid carrying your shopping bags during countryside travel. When bargaining with shopkeepers, stay calm, be friendly and keep smile on your face. What to do/ what not to do: Travel itinerary and some research will help you avoid unnecessary hassle. Review before you choose a hotel from internet and see other’s comments on it. Try to wear decent clothes especially when entering to sacred places. Be quiet at the places of worship. Don’t take local’s picture without asking their permission. You can plan any trip there from visiting cultural sites, mountain climb to wild safari. 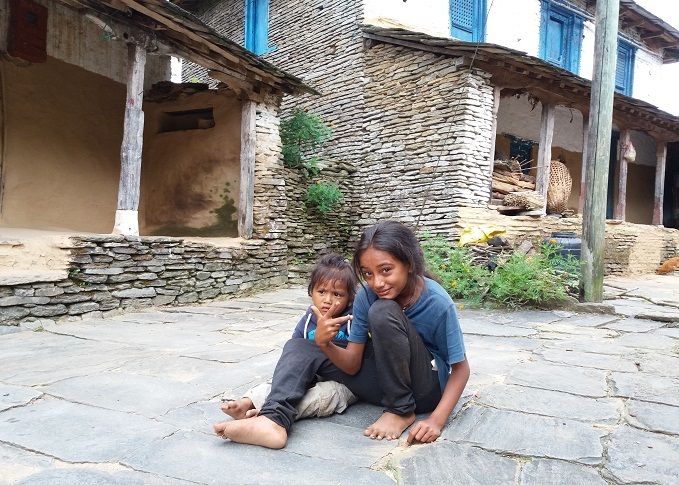 Whichever Nepal trip you choose, I can assure, you have never been anywhere like there.